What is the Best Material Type for Snowboard Mitts? How to Dry Snowboard Gloves Properly? What are Snowboard Pipe Gloves? Welcome to the review of the best snowboard gloves of 2019. When snowboarding, it is important that you are equipped with all the right gear. Snowboarding is an extreme sport and it involves a lot of risks as well, therefore doing it without the proper gear is not so advisable. If you’re looking to keep your feet warm with skiing socks check out our guide here. Gear such as snow helmets for safety are completely essential. If you’re a Skiier, you can check out our review on the top rated ski helmets here. One of the snowboarding gears are snowboard gloves. It is a common concept of an amateur who has never been snowboarding before, that mittens are not that important. But this is actually not true, you have got to keep your hands warm all the time while snowboarding because if you are not going to do so you will not be able to maintain a grip on the sticks for long. Hence mittens are essential while snowboarding. Keep your legs warm when snowboarding – with some snowboard pants (click for review). There are quite a few snowboard mittens available in the market these days. These mittens come in different styles and designed for different tastes and weather conditions. In the opinion of some of the top snowboarders out there the bulkier the mittens the warmer they are. If you are a Skiier, both the Gloves and Ski Pants are important. For Skiers, you may wish to go to our review on the top ski gloves and mittens. When choosing mittens for snowboarding there are some key factors that most of the snowboarders consider. These key factors include keeping the hand warm for a longer period, comfortability and durability. The Hestra Heli Snowboard Gloves is actually a perfect blend of all these factors. + When talking about these gloves you can be sure that no wind or water can damage them as these are made of HESTRA Triton three-layer polyamide fabric which is wind and waterproof. + These mittens are made to last and can take quite a bit of a hammering since the leather palm is made up of army-standard leather – goat. + The comfort that you will experience with these gloves is just best. There is no excess material on the palm and also the design of the mittens is that of a hand’s natural ergonomics. + When you have these gloves on you can be sure that no snow can penetrate them and reach your hand as they come with snow lock with Velcro closure. Why We Liked It – The modern features will make you fall in love with these pair of mittens. Just about everything in these gloves is picture perfect. Whether it be the comfort level that these mittens have on offer or the durability. Some people might find the price to be a bit on the higher side, but once you have you will realize the value they offer, these are worth every penny. When your aim is to snowboard at the highest peaks of around 8,000 meters these babies are just the perfect companion. The Outdoor Research Alti Snowboarding Mittens has everything that you would look for in a pair of the best gloves when snowboarding. It does not matter how brutal the use is these mittens are made to last. These pair of gloves give you a comfy feeling so you can focus on the terrain altogether and do not have to worry about uncomfortable hands. + The alti snowboarding mittens are 100 percent nylon and at the same 100 percent polyester insulated keeping your hands dry all the time. + These mittens come in with ToughTek LT Tabs making sure that your hand does not slip at all no matter how fierce you snowboard. 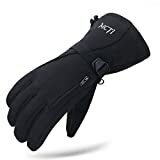 + It is obvious that while snowboarding you may experience some moisture in your hand but not with these babies on because these are Moisture Wicking gloves. + These gloves are water and windproof at the same time but the material that is used in the making of these mittens is quite breathable as well. Why We Liked It – If you have a pair of gloves that actually deliver while you snowboard, the experience of being out there in the wild just multiplies. The Men Alti Mitts does just that, so you completely focus on maximizing your snowboarding skills and techniques without focusing on anything else. It is really important for a pair of gloves to be very comfortable and it should not hinder your hand movement. The pair of mittens should also be a perfect fit for you. When you see all these qualities in a single pair of mittens, just make sure that you buy them. The North Face Apex Etip Gloves intend to do just that and they exceed quite well at what they intend. It is a common concept that the bulkier the mittens are the warmer they would be. But this pair of gloves actually defies this concept. These are pretty lightweight mittens but extremely warm at the same time. + These gloves are made of polyester which is the preferred cloth for any sort of gloves. + These mittens are UR® Powered and at the palm, these gloves have a TNFTM Apex ClimateBlock soft shell which makes them touchscreen compatible. + The palm of these mittens is a synthetic gripper palm which provides a superior grip as compared to some other gloves. + There is also a PU tab at the cuff of these gloves so you put them on and take them off quite easily. Why We Liked It – When you have a pair of glove that is not only the best with snowboarding but also has some other advantages like you can use your smartphone easily while the gloves are on – why would you not go for them? As the North Face Apex Etip Gloves enables you to multitask with ease and hence become one of the favoured mittens by pros. Hesta is the largest exporters of gloves in the world today. The company was found back in 1936 and since then it has been producing some state of the art sports mittens. Nobody could think back then that such a small family business could make it this large as it has today. The Hestra Fall Line Leather Snow Sport Gloves are one of the best glove pairs that you will find in the market these days. Well, it would be enough to say that these mittens have a brand name of Hestra attached to them to make them prominent from the rest. + These gloves are made of Cowhide, which is a quite durable leather that also has best impregnation properties as well. + Cowhide is best in resisting the moisture and abrasion so when you have these gloves on your hands feel dry all the time. + These mittens are made with the outseams sewing technology which is really comfortable for the fingers and also provides a superior grip. + The cuff of these mittens is neoprene and also have a velcro closure, therefore, you can put them on or off with the utmost of ease. Why We Liked It – When you have a pair of mittens that fits perfectly, is extremely comfortable and keeps your hands warm – what else do you need? All these qualities make the Hestra Fall Line Leather Snow Sport Gloves one of the best in business. Whether it is a short session ski/board that you are going on or a complete expedition these gloves will provide you with all the protection and the warmth you need. All the materials used in the making of these gloves are of premium quality, same as you will find in any professional-level mittens. The comfort level provided by these gloves is also at the highest. The Black Diamond Crew Cold Weather Gloves are not only best when you snowboard but also if you are going on a mountain climbing expedition for days. These mittens can deliver, no matter what the situation is. + These gloves are abrasion-resistant gloves and also have a woven nylon shell that can be stretched in 4-ways so that your fingers do not feel stiff. + These mittens come in with a fixed lining that is 100 percent waterproof and breathable at the same time. + The shell of these gloves is 92 percent nylon and 8 percent Spandex making sure that these gloves can take on quite a bit of a hammering. + The palm of these mittens is 100 percent goatskin which is best for gripping. Why We Liked It – These gloves have the ability to go on and on for days without any wear and tear and without making you uncomfortable at all. Therefore, these gloves are not only effective in small ski sessions but also longer expeditions at the same time. A complete multipurpose pair of gloves that are built to last. There is nothing better than a bulky glove while snowboarding. The moment you see a bulky pair of mittens you say to yourself that this is going to provide me the warmth that I was looking for. This is exactly what you can expect from the Swany X-Change Snowboard Gloves. It is really important for snowboard gloves to fit perfectly and do not hinder the movement of the fingers and this pair of gloves is designed to provide you just that. All in all, with the Swany X-Change Snowboard Gloves you are entitled to a complete package. + This pair of gloves is made of 100 percent leather making sure it lasts in the most intense use as well. + These mittens come in with a quick release strap so you do not have to fight your way through to take them off. 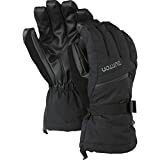 + These gloves have a rolled finger construction making sure that your grip on the sticks stays firm while you snowboard. + Comes in equipped with utility heat pock with aqua-guard lock down zipper keeping the warmth intact and the wetness away from the hands. Why We Liked It – These mittens have all the qualities that you want to see in a pair of snowboard gloves, whether it is the durability or the comfort, the warmth or the grip. Therefore, there is no point that you will not like these gloves on your hand while you snowboard. A pair of gloves that has a brand name of Hestra attached with it, that is enough for the credibility of that glove. But since this is a review we have to look into some details. A pretty bulky pair of gloves that ensures the warmth. It is made up of army leather, therefore, the durability is outstanding. It provides the same comfort level as you would find in most of the mittens by Hestra. + This pair of gloves is made up of army leather so you can expect it to last for long even when used quite roughly. + The upper section of the gloves is made of windproof and waterproof material and at the same time is quite breathable as well, keeping you warm dry and comfy. + It comes in with fiberfill an insulating material made out of polyester fiber making sure the warmth stays within the gloves. Why We Liked It – As far as snowboarding is concerned, you will not be able to find so many qualities under one roof as you would with the Hestra CZone Mountain 3-Finger Glove. Therefore, it can be rated as one of the best snowboard mitts available in the market these days. A relatively well-known brand in the United States is Rome Snowboards that manufactures some top quality snowboard gloves that are preferred by many snowboard professionals out there. This pair of gloves also has all the quality of one of the best pairs of gloves for snowboarding. + The construction of these gloves is full tech leather enabling them to take quite a bit of wear and tear and also making them durable. + These mittens come in equipped with a Hipora 5000 waterproof insert making sure absolutely no water reaches your hands. + There is absolutely no fur used in the construction of these gloves which enhances their grip. Why We Liked It – A pair of gloves that keeps the warmth within, keeps your hands and fingers dry and provides amazing durability at the same time. It is really ideal for snowboarding. You can expect a lot from the Rome Snowboards Rk1 Mittens and that is what makes them stand apart from the competition. A snowboarder would love a pair of gloves that are ideally designed for his lifestyle. The POC Park Snowboard mittens are designed to serve only this purpose. If you talk about multitasking these mittens are not that good but it is not what they are designed for. + The construction of these gloves is a mix of goatskin and flexible fabric to withstand the hammering that is there in snowboarding. + The flexible fabric also enhances the grip of the snowboarders. + These mittens come in with a detachable wrist leash making them quite easy to wear and take off. Why We Liked It – A pair of gloves only designed to serve one purpose and that is snowboarding, do we have to say more to prove that these are one of the very best in the business. Nothing can beat the feeling of multitasking. If you feel tired of snowboarding and want to talk to a friend on text messages the Burton Gondy Gore-Tex Leather Mitts is just the perfect pair of mittens for you. + These gloves come in with a GORE-TEX membrane which is windproof, waterproof and breathable at the same time. + These mittens are also equipped with thermacore insulation making sure that the warmth stays within the glove. Why We Liked It – The Burton Gondy Gore-Tex Leather Mitts are a really cool pair of gloves that have the ability of multitasking, if you are bored with the snowboarding you can switch to Burton-exclusive screen grab Tech and start using your phone. Quality ski mittens can make your skateboarding or skiing experience far better. Mittens are considered as the most important element of your gear as an uncomfortable pair can ruin the whole tempo. Stores are jam-packed with a variety of skiing gloves but what if you know non-about the game? Don’t fade away as we are here to feed you with every bit of knowledge related to skiing gloves. Keep up with us and we’ll make sure that you are fueled up by the right one. As they say that size matters in every aspect of life, it goes for a pair of skiing glove as well. Before looking for discount offers you must make sure that your pick must have a correct fit. A glove that is too small will be uncomfortable while a glove too large can cause painful pressure points and zero control. You need to examine every bit before paying the price for the choice. Unlike casual gloves, a skiing glove is tailored differently for every gender to attain the perfect size. Women’s gloves are designed to fit different palm sizes, and men’s are manufactured differently. So you need to be gender specific while investing in any pair of gloves. Skiers who want that comfy feel often invest in a little big size while others who want a performance boost consider small and tight gloves. Just choose the correct size according to your hand and be ready to touch down an adventurous skiing journey. Unlike a casual winter glove, a skiing glove is made up of different material depending on the manufacturer. We’ll list down most common yet best materials that are used to manufacture a skiing glove. Mittens that are made up of wool excel at providing warmth and kicking out every bit of moisture. These gloves are counted amongst the most durable and long-lasting options. Synthetic gloves are a blend of nylon, acrylic, and polyester. Skiers who look for utmost thermal control and comfort prefer gloves made up of synthetic material. As synthetic is a blend of different material a manufacturer can take advantage of many factors. When wool meets synthetic one can expect a lot. The majority of skiers love this blend as it holds every single factor that boosts up the skiing experience to a whole new level. So now which material you recommend the most? Choose wisely according to your personal preference to pump up your skiing game. After going thoroughly through the guide above one can easily pick the best skiing glove. What about the expert’s say? We’ll list down three picks that top their category. This section covers the product that is loved by the masses regardless of any filter. Heli Ski and Ride Glove with Gauntlet by Hestra is renowned amongst every customer who doesn’t want to compromise the skiing experience. A lot of functions and modern classic design makes this glove the choice of many out there. Triton three layer polyamide fabric is Hestra’s patent material that features the qualities of windproof, waterproof and breathiness. Now you can rock the mountains without worrying about any problem. Gripping depends upon the palm material used in any glove. This glove’s palm is made up of army leather-goat that pumps up the gripping game to a whole new level. Perfect glove fit is the key to best skiing experience. Eagle grip construction with a minimal excess material in the palm and ergonomic fit make sure that everything is fit and tight to every consumer. One can’t afford to lose heli-ski and ride glove with gauntlet by Hestra. With army leather-goat palm, eagle grip construction and polyester insulation this glove has some serious potential. When it comes to the best glove ever one can rely on your premium choice sector. Alti snowboarding mittens by outdoor research were made to be tough and handle every abuse. No matter what the conditions are these gloves will make you feel like it is a bright sunny day. They are great for gripping onto the handle on a snow scooter, in particular. One can expect a much out of these gloves as they are made for 8,000-meter peaks and arctic expeditions. Wear these gloves to stay warm, protected and focus to make history. These gloves are constructed with breathable and waterproof GORE-TEX to make sure that you are away from moist. Similarly, no matter which scenario you throw at these gloves they’ll come out durable. Best insulation is key to dry and warm hands. Water-resistant PrimaLoft Gold insulation makes sure that your hands stay warm and well out of any moisture. Similarly, Moonlite Pile Fleece liner create a comfortable feel while protecting your hands from cold. With pre-curved box construction, three-panel thumb and glove clips alti snowboarding mittens can take you to a whole new level of skiing. Product enlisted in our great value category makes sure that every penny spent on it is verified. Don’t get fooled away by the price tag as Men’s Apex Etip Glove by The North Face has gained some serious audience. No matter what the weather conditions are these gloves have got your back. The superior grip is all that one needs to level up the skiing game. Synthetic gripper palm featured in this glove make sure that you are backed up by the tightest grip. Similarly, wind and moisture is blocked by TNFTM Apex climateblock soft shell featured at the back of hands. Men’s Apex Etip Glove by North Face has got some serious backing for skiers. With TNFTM Apex climateblock soft shell, synthetic gripper palm and soft shell featured in this glove make you the king of the ring. • You should dry your gloves immediately as longer you wait the more likely fungus will reside. • Don’t put your gloves directly in a dryer. Instead, place them in a warm area for hours to avoid material damage. • After drying you’ll feel that they have shrunk. In order to avoid any issues, you must invest in a waterproof glove. Pipe gloves are meant for summer conditions as they don’t have any insulation. These gloves will not give your hands with a full warmth (click to read the study) i feel unless the conditions are above freezing. We hope to help you find the warmest mittens & gloves for snowboarding, so that you can keep warm – see the Study by Tiffany Chueng. Previous articleWhat is an Electric Longboard? Next articleAre Electric Skateboards Safe?